"Having travelled the world with Jordi Savall, 3MA (Ballaké Sissoko and Rajery), Paolo Fresu, Debashish Bhattacharya and Montserrat Figueras and having lent his oud playing to Armand Amar and Laurent Voulzy, Driss El Maloumi has returned home. In Agadir, at the crossroads of Arab, Amazigh, western and sub-Saharan cultures, he invites his oud to distil the spices gleaned from a thousand travelled paths. Quietly, simply, in intimate dialogue with two percussionists, so that his instrument can fully express his desire to revel in the contact with other essences, other colours. 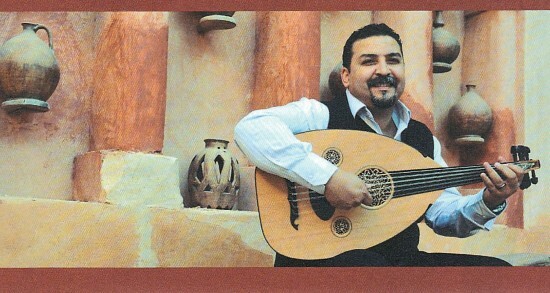 To translate this personal journey between his own tradition and encounters with other cultures into music, Driss El Maloumi offers himself time to pause and reflect. He dares to take a step back and question given truths. Of course, he knows that he is formed by this heritage, but he also lays claim to a certain permeability. He loves tradition, its structure, strength and dignity. But he needs to leave his oud in order to satisfy his desires. A need to go and see whether it can vibrate outside the constraints of tradition, matched with a desire to know how it will respond when brought into contact with an Iranian zarb or percussion from Madagascar. Can he find the freedom to let go of everything while greedily retaining what is sent to him, unleashing the possibilities of exchange and adventure? Can he then return to his personal heritage, cherish it and allow it to take flight above prejudice and beyond what is prohibited? And to nourish tradition so that it never forgets its greediness, to prevent it from drying up in its obligatory structures. Driss El Maloumi embarks on this marvellous journey and invites us, once again, to accompany him. He deftly avoids the pitfalls of cold virtuosity and traditional fundamentalism; he releases his music into the air and offers us delicate perfumes carried by a gentle breeze brought by him."